Against The Odds, A Pro Soccer Team In Kashmir Is Close To Winning India's Top Title Real Kashmir FC is less than three years old and plays soccer in a troubled Himalayan region prone to violence, strikes and heavy snow. Soldiers with machine guns patrol the home stadium. 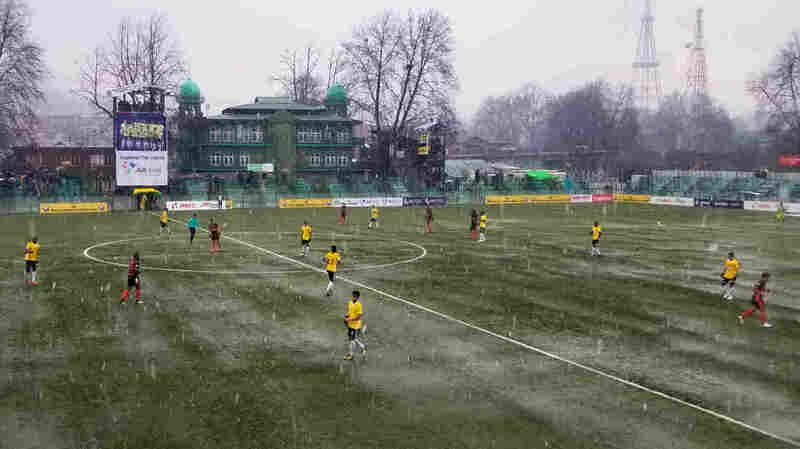 Snowflakes began accumulating on the turf by halftime during a Feb. 6 game at Real Kashmir's home stadium in Srinagar. The coach of the visiting team said later that some members of his team, from southern India, had never seen snow. Now, against all odds, Real Kashmir Football Club, from Indian-controlled Kashmir, is tantalizingly close to winning India's top professional soccer title. They've been flitting back and forth between first, second and third place, and the season ends in early March. "We're the only club in India that has sold-out stadiums at almost every game," says the team's co-founder Shamim Mehraj. "What we have done is give people some hope in a place that has actually been taken down by conflict and violence for the past 60 years. It's helping this place heal." Kashmir's recent history has been chaotic. It has seen three wars between India and Pakistan and is the site of a decades-long separatist insurgency that Indian forces have often dealt with violently. The valley is part of Hindu-majority India's only Muslim-majority state, Jammu and Kashmir. A natural disaster helped give birth to this soccer team. In 2014, the Kashmir Valley suffered devastating floods. Hundreds of people were killed. Schools were closed, and young people spilled out onto the streets of Mehraj's hometown Srinagar, the summer capital of Jammu and Kashmir and one of the largest cities in the valley. One evening, Mehraj and a friend had an idea. "We used to go for evening walks. We would see a lot of kids hanging around doing nothing, and I had been a footballer myself. That's when I thought, 'Why don't I get some balls and at least give these kids something to do?'" recalls Mehraj, 38. He had played for his college team in New Delhi, and for his state in amateur soccer tournaments. Mehraj, who is Muslim, and his Hindu friend Sandeep Chattoo, 52, got friends and neighbors to pitch in and buy 1,000 soccer balls, which they handed out to flood victims. But why stop there? In March 2016, they started a team. 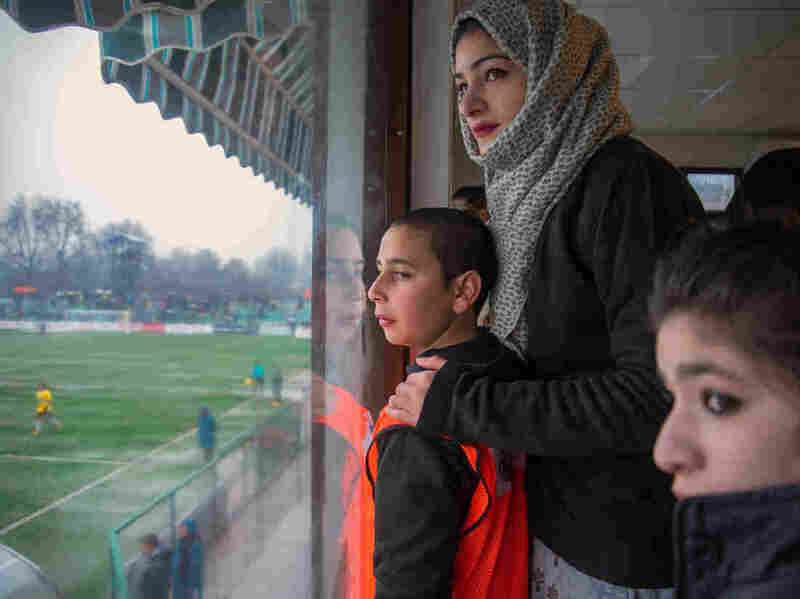 Mahak Farooq (center), 24, watches her brother Danish Farooq, who plays midfield for Real Kashmir, alongside 12-year-old Urooj Ayyub Bhat (left), a local boy who's one of the team's most loyal fans and a fixture at home games. 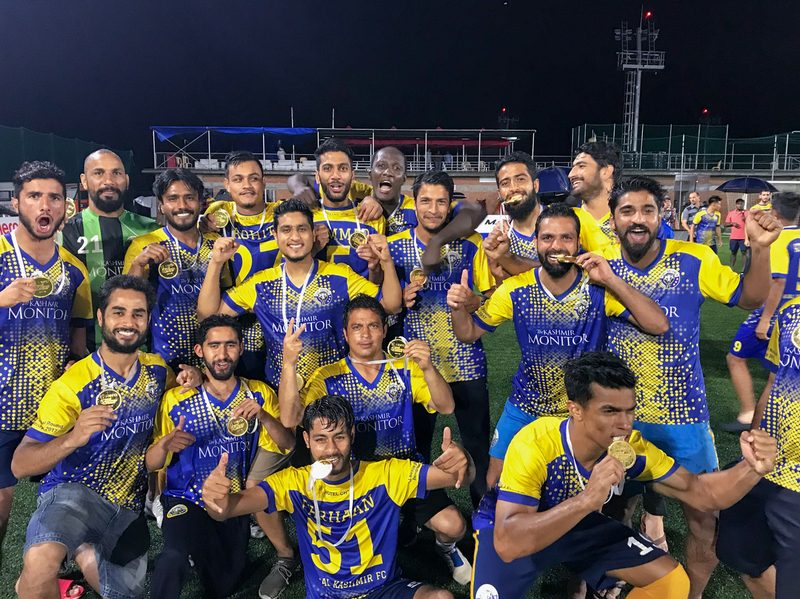 They applied for the team to compete in India's I-League 2nd Division — the pro soccer equivalent of baseball's minor leagues. Mehraj and Chattoo invested their own money to pay players' salaries. They also hired a Scottish former player, David Robertson, who had been coaching a professional soccer team in Phoenix, Arizona, to coach Real Kashmir, a.k.a. the "Snow Leopards." Robertson had never been to India, and admits he probably couldn't have placed Kashmir on a map. "All I ever saw was TV shows that showed it's 90 degrees — it's hot in India! But I arrived here and the next day, it was snowing," says Robertson, 50, now in his third season as Real Kashmir's coach. "There was no Internet, the electricity was out, and I just thought, 'I want to go home.'" Mehraj invited Robertson over to his family's house, gave him a hot water bottle and some home-cooked Kashmiri food — and convinced him to stay. Since then, Robertson has recruited his own son, Mason Robertson, 24, to play for Real Kashmir. By the end of the 2017-2018 season, several Robertson relatives were in the stands at the team's home stadium in Srinagar, to watch Real Kashmir win the 2nd Division title. This season, the team was promoted to the I-League's top division, the first soccer team from Kashmir ever to qualify. (There is one other Kashmiri pro soccer team, Lone Star Kashmir FC, which plays in the I-League's 2nd Division). In October, Real Kashmir signed a lucrative sponsorship deal with the sports giant Adidas. The brand features prominently on team uniforms and advertisements, and helps pay the salaries Mehraj and Chattoo had initially paid from their own pockets. 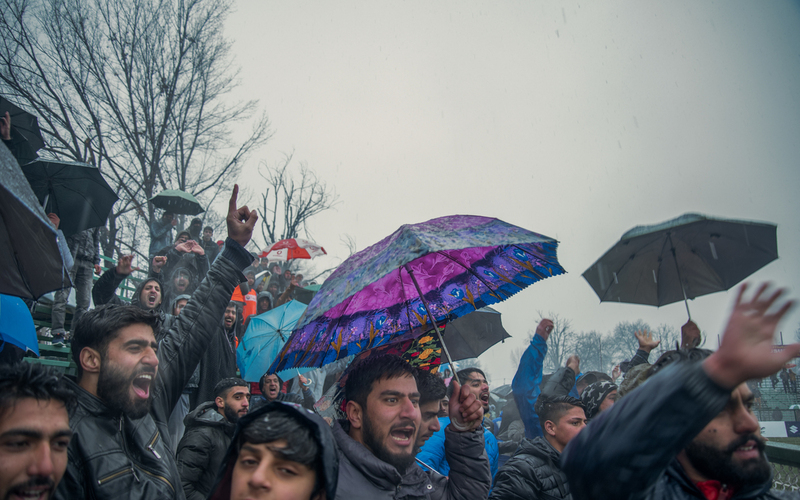 Fans braved sleet and snow to watch Real Kashmir play a home game on Feb. 6 in Srinagar. "I never did think we would go this far," Mehraj tells NPR, as he looks out over the turf at Real Kashmir's home stadium. There are constant reminders of the violence. On Feb. 14, a suicide car bomber killed dozens of Indian security forces on a main highway on the outskirts of Srinagar, where Real Kashmir plays home games. Curfews were imposed in the aftermath. The I-League Division 1 reigning champions Minerva Punjab FC, who were supposed to travel to Srinagar for a match four days later, refused to show up, citing safety concerns. In Srinagar's old quarter, the Muslim call to prayer reverberates through a warren of lanes sprayed with militant graffiti saying "India Go Home" and "Free Kashmir," with the names of Kashmiri militants who have been killed in fighting. Kashmir's 21 percent unemployment rate is triple that of the rest of India and militant groups recruit from the ranks of young, idle Kashmiri men. 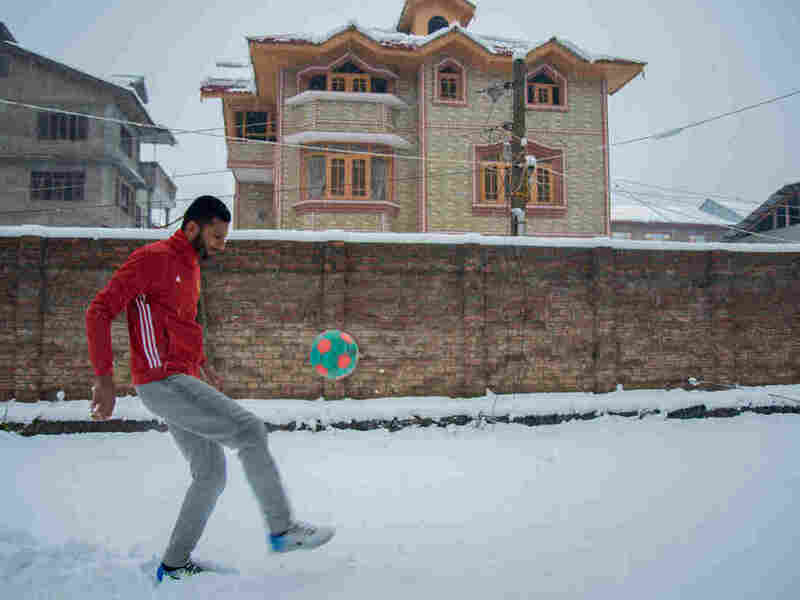 Soccer "keeps him away from that," says Ishfaq Hussain, 52, a former professional cricket player whose son Muhammad Hammad plays center-back for Real Kashmir. "He thinks always about when to play, when to practice. He's got no time to join politics or go shouting or pelleting stones." Hammad, 21, often has to circumvent police curfews to make it to morning soccer practice. Muhammad Hammad, 21, kicks a soccer ball outside his family home in Srinagar. Hammad plays center-back for Real Kashmir as it vies for the top title in Indian professional soccer. "If the practice is at 11 o'clock, I have to leave home at 8 or 7 a.m. because there will be curfew around the city and you are not able to move around," says Hammad. "The conditions here, you get much more motivation to achieve something. I have struggled a lot. These things also motivate you." 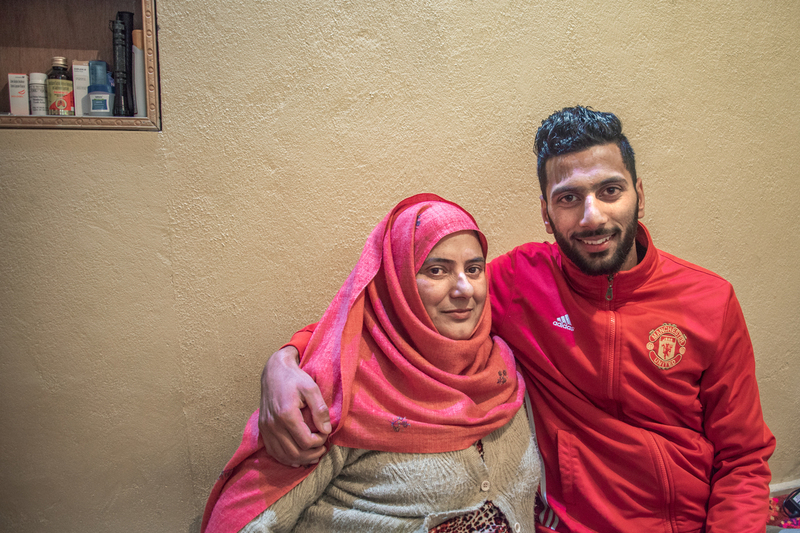 When NPR visited Hammad at his parents' home, his mother Mahjabeen, 46, got choked up describing how proud she is to watch her son play professional soccer. She has a giant flat-screen TV mounted on the wall of her living room to watch all of her son's games. She describes how neighborhood children constantly ring their doorbell, hoping for a chance to kick around a soccer ball with Hammad. His teammates include fellow Kashmiris and recruits from Africa, Europe and across India — including Muslims, Hindus, Christians and atheists. Mehraj says he can't manufacture T-shirts, stickers and banners fast enough to keep up with fans' demand. Muhammad Hammad (right), 21, who plays center-back for Real Kashmir, sits at home with his mother Mahjabeen. At a Feb. 6 home game, fat snowflakes began accumulating on the turf at a scoreless halftime. Drenched fans huddled in the bleachers under long plastic tarps, screaming. Schoolgirls in headscarves swooned. Real Kashmir scored the winning goal against Gokulam Kerala FC, from southern India, in the 51st minute. As the referee's whistle sounded and the home team moved one match closer to India's top soccer title, the crowd of shivering, ecstatic Kashmiris erupted in cheers. "You're always rooting for the underdog, and I think Kashmir are that," observes Sumedh Bilgi, an Indian sports journalist who's watched the team's improbable rise. "Ultimately, money rules the world. But you always want your fairy tale, don't you?" Team photo after Real Kashmir won India's I-League 2nd Division title in May 2018.